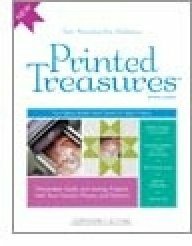 Tools > Printed Treasures Photo Fabric 5 PK. Printed Treasures Photo Fabric 5 PK. This is 200 thread count fabric bonded to paper; you can put the 8 1/2" x 11" sheet into your inkject printer and print any image that you want. You then peel off the paper (there is no adhesive), and use the soft fabric as you would any quilt fabric. It washes with virtually no fading. Full instructions are included.